It's not every day your hard-working student athletes make tournament appearances or win championships. Commemorate these achievements with the recognition they deserve—a championship school banner hanging proudly in your gymnasium or fieldhouse. These championship school banners preserve the hard-earned accomplishment with the respect it deserves, and emit school pride and tradition amongst your student body and community. Distinguished by their vibrant color and striking design, Neff Digital Banners are the ideal way to showcase your championships. Our unique manufacturing process produces the most durable vinyl banners in the industry and our unparalleled standards for quality and design make our banners the #1 choice for America’s schools. Choose from our standard heavyweight Celex banners or mid-weight radiance championship school banners. Both feature sharp, photo-quality graphics with unmatched color and image clarity. Horizontal, vertical, V-bottom and pennant shapes are available, in both standard and custom sizes, with your choice of grommets or pole pockets. Had something else in mind? 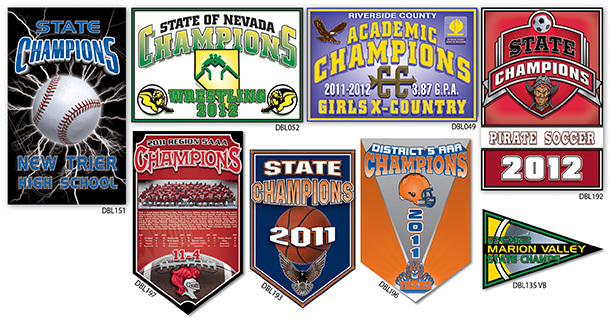 Check out our add a year school banners, sportsmanship school banners and traditional felt school banners, view our full Banner Catalog, or take a look at our full school banner collection.